Mr. & Mrs. Woody have only been seen once in the last week. I saw a ‘pecker go into the hole on one occasion so I suspected they were still using it in some capacity. Then yesterday Mrs. Ha saw one go in. We hear them all the time but once the leaves are on the tree seeing them is more challenging. Just after breakfast today I saw a flash of green dive into the hole and as it did so another sped out. Change over time! I went into my British Birds archive and found a fascinating note from vol. 39 describing a full breeding cycle observed in 1944. This indicated that both birds incubate the eggs and swap over every 3 hours or so.The incubation period seems to be anything from 12 to 19 days (disputed) and fledging occurs after about 3 weeks. If we are lucky we may still be here if and when the youngsters leave the nest. If we are unlucky it may all happen whilst we are away. The weather forecast was for heavy rain overnight so I did not trap last night. Seeing the Woodys again made up for that. The end of May looms. I am not sure whether time is dragging or accelerating. Each day we seem to be trying to hurdle our way through golden syrup. Then all of a sudden the week has ended and we reset ourselves for the next bout of steeple chasing. I always seem to embarrass myself at the water jump. It must be an age thing. The garden is changing. The last bluebells and primroses hang on by their fingertips, nails screeching down the green sward as they slide reluctantly to the ground. The docks point high and the pignut spreads itself throughout the copse. The nettles are in waiting for the unsuspecting. I have had one brush with them. A rub with a dock leaf sorted me in a few seconds. The azaleas are past and the rhododendron will follow. I have started to open up a path behind the pond. The irises are still budding and now a fringe of vivid yellow breaks through like a chick emerging from its shell. All they need is a few dragonfly larvae and I shall be happy. We have raised the crown of the large fir tree in the front garden and removed a leylandii. These 2 simple steps have created much more light and a sense of extra space. Behind the fir the Monkey Puzzle is revealed to the world, blinking at the unaccustomed brightness that pours down onto it. The lawns have been cut, the terrace strimmed, part of the laurel hedge cut back and a rickety fence torn down, lying vanquished on the floor, waiting to be removed from the battlefield. This will provide more access. A case of misidentity leads to the early demise to a Kiwi fruit tree. Sadly I find three plastic bags of rubbish hitherto hidden by the hedge. Beer cans as far as I can tell. A broken ceramic pot appeals to me as a possible nest site for a not-too-picky bird. Light and airy (hole in the roof) with an open living space that is versatile for any avian family. Beautifully decorated in cobalt blue outside and a smooth, durian cream on the inner. Available on very reasonable terms. I leave it in the garden, wedged in a place that looks safe from predators. A “To Let” sign may follow. Maybe I shall call it “Trespassers Will”. At the rear I have found a chestnut tree poking a few branches out. Ash saplings spring up in all the wrong places. They will have to come out. It has been agreed that we will coppice the hazels later and that will create more light in the under growth. I will have some fine hazel poles. Even wilderness has to be managed not neglected. The moths continue to trickle in. Thursday was a bumper morning. Friday was a disappointment. Still, I am now on 116 species and June should be more productive. We have a trip to HK planned and that will give us respite from the refurbishment. Already we are starting to think about a world in which the house is largely finished; our container can come out of storage; life can return to some semblance of normality. What I wonder does normality look like? There was an outing today to Farley Mount. It poured with rain. As we drove past the golf club there was a suggestion that I might join and rekindle my old passion. What’s your handicap? asks the old joke. The clubs and the ball, is the usual pithy riposte. I once, in another life, played off 13. Became disillusioned one day, put my clubs in the back of the garage and never played again. I lie. Once in 25 years. A story in itself and for another day. I really don’t see me out there again in all weathers, sporting my Rupert Bear trousers and Pringle sweater. Golf is for ambitious youngsters, who yearn to be like The Golden Bear, peeling off a sweater at St. Andrews to drive the green. And for good-humoured oldies who relive those days of power and glory without the need to prove their virility by outdriving all others. Now they craft their way round the course, rather shorter off the tee but a lot smarter reading the greens. Me? I’m too old to rock’n’golf and to young to die. Alice Cooper is an accomplished golfer. Did you know that? How did he get from “School’s Out” to “Fine putt, sir”? No, I think I’ll walk around my garden a few more times yet. We need each other. I found Wood Avens, Geum urbanum in the garden today. That is fortunate because it has the power to drive away evil spirits, and to protect against rabid dogs and venomous snakes. Our house is full of both. Or do I mean builders and plumbers? I also found a Hornet, Vespa crabro. 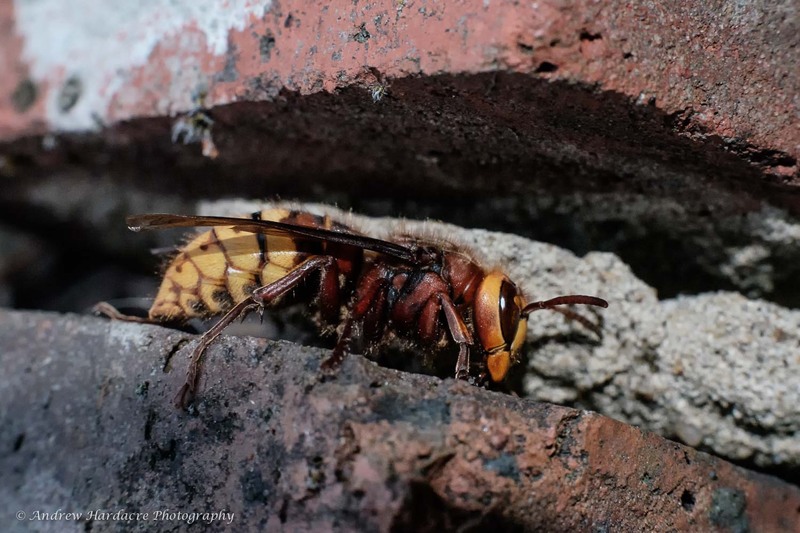 People seem to be terrified of hornets but I understand they are not normally aggressive. I did not put this to the test. It posed happily enough for a photo and then we went our respective ways. At 7am Mr. R.O.E. Deer arrived and spent half an hour with us. The photos are too poor because of the dull light but he now has his shiny summer coat and looks very fine. I wonder if he is young as I have only ever seen him alone and never with a family. We have been out all day meeting up with an old friend and so my time in the garden has been limited. Over the weekend I found a couple of decent beetles and of course I kept the trap running. Whilst we were out my new moth trap arrived. A Robinson trap uses a mercury vapour lamp and in theory should pull in more leps. We shall see tomorrow night. Provided nobody complains. Perhaps the rabid snakes and venomous dogs will not like it. Another busy day tomorrow as the Princess has booked herself a pampering Pom session at the Poodle Parlour. She woke us at 04.30 today so I think it is we who need the pampering. Mrs. Ha was not amused. I suppose it could be worse. We might wake up tomorrow and find the deer in the bedroom demanding yoghurt and fried bacon for breakfast instead of apple blossom and Dock leaves. Sorry dear. Bluebells are off. 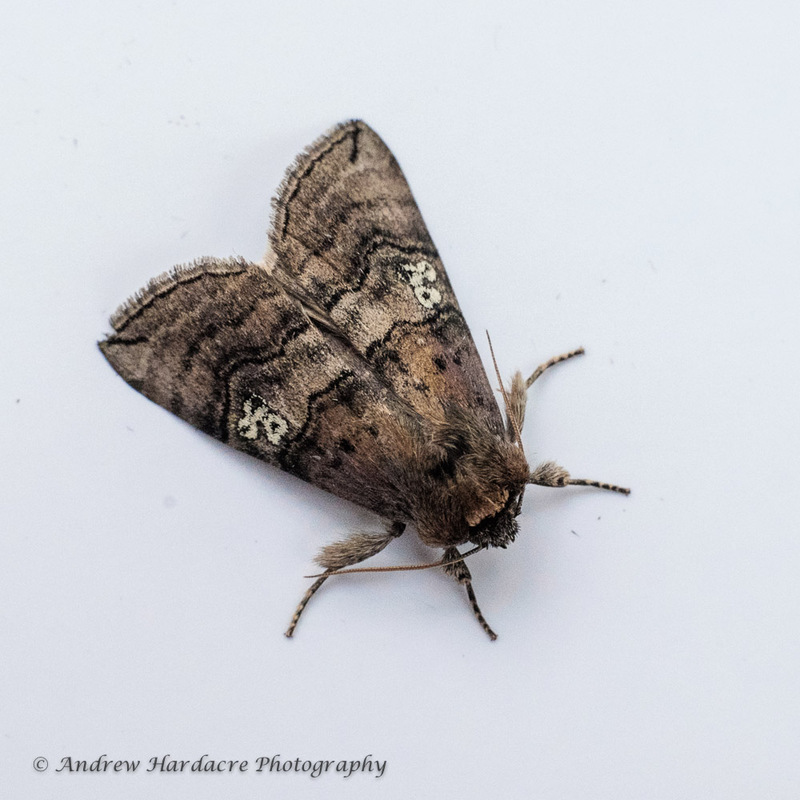 Moth of the Day, Tethea ocularis also known, rather bizarrely, as the Figure of Eighty Moth. I have no idea why.